Last month I had the amazing opportunity to live sketch at São Paulo Fashion Week. It was a lucky coincidence while planning a personal trip to Brazil that it was happening while I was there, so I knew I had to make the effort to at least get one day to sketch! São Paulo Fashion Week is considered the fifth largest fashion week in the world, after New York, London, Milan and Paris. I've just begun exploring the Brazilian fashion industry and the local designers there, but so far it has proven to be a perfect source of inspiration for me. I find the design to be full of colour, print and femininity. I've never been a huge fan of androgenous or minimalistic trends so you can imagine my excitement in discovering this Brazilian aesthetic. I attended three shows; ViX Paula Hermanny, Lilly Sarti, and Fabiana Milazzo. Click the images to open my SPFW sketches gallery. My next show was Lilly Sarti, a sportswear brand. The show had a casual, relaxed, 70's vibe, but still chic. They used a great orange in a few pieces of the collection, a sort of yellow-mustard-orange that I was able to capture in one of my sketches. My final show was Fabiana Milazzo, a perfect way to end. I was excited to attend this show, having seen some of pieces from the designer in their showroom when picking up my tickets the week before. Everything was light and feminine, with lots of beading and sequin, in gold, blush and blues. It all had an ethereal quality and was basically my dream wardrobe. The show did not disappoint, lots of embellishment and a gorgeous colour palette! Of course I had to sketch my favourite part of SPFW, the street style. 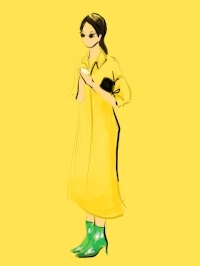 My love for sketching street style has developed over the past year. There's an individuality and character to street style that I find makes such an interesting subject. 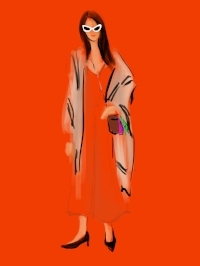 Bold, saturated colours where very popular at SPFW so naturally I jumped on sketching the trend. I love this collection of sketches the most, I feel like it really captured the feeling of São Paulo Fashion Week. Click here to open the gallery of the images!